Restaurant discovery platform Taste Savant has announced the launch of its mobile application on iOS, which aims to help users discover the best restaurants through its recommendation platform. The Taste Savant app features location-based searching, reviews and more, and offers support for restaurant reservations and order deliveries. Users can search for restaurants by neighborhood, type of cuisine, special occasion and desired price range. Taste Savant features Open Table and Grub Hub integration for finding restaurant reservations or making orders for delivery from within the app. 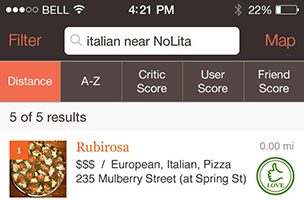 As users search for restaurants, they can browse their results based on distance, overall critic scores, user scores and friend scores. Taste Savant currently supports diners in New York City, Los Angeles, Chicago and Boston. The app’s recommendations and reviews come from chefs, restaurant critics, health and fitness experts, and other ‘credible’ sources, as well as bloggers who have accumulated large followings. The platform also offers support for following friends’ reviews via Facebook and Twitter integration. Taste Savant is available to download for free on iOS. Check back soon to follow the app on AppData, our tracking platform for mobile and social apps and developers.